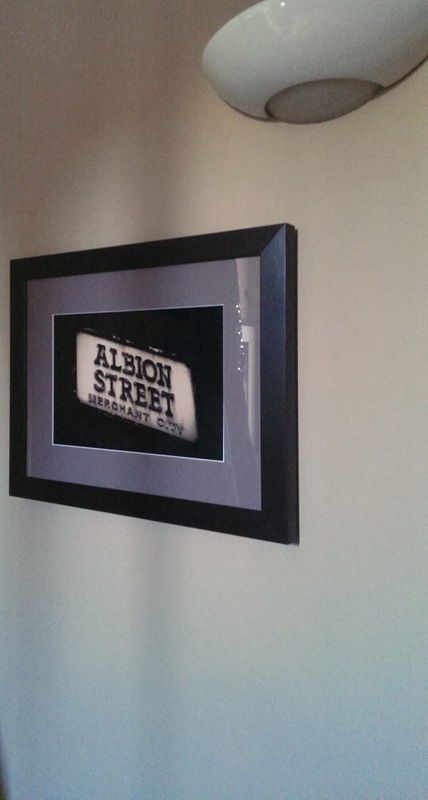 Merchant City is Glasgow's most stylish area; with high-end boutiques such as Mulberry and Ralph Lauren. Last week we stayed here at luxury serviced apartments, the Fraser Suites; which have recently relaunched after a refurbishment. 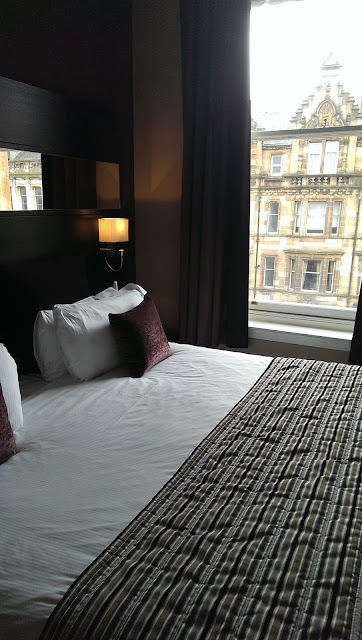 We stayed in a one-bedroom apartment which comprised of a small entrance hall, a bathroom, bedroom with king size bed, and a living room with built-in kitchen area. Photography of Glasgow street signs and landmarks filled the apartment and our floor's corridors. 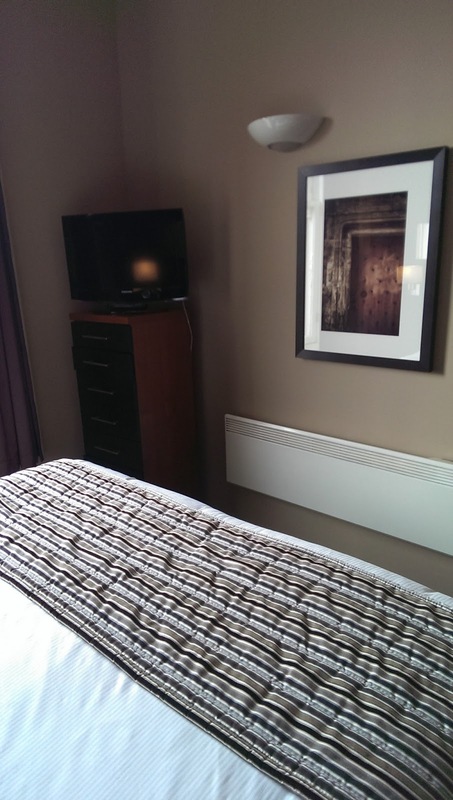 The design was modern and stylish; with lots of luxurious touches in the fabrics and decor. 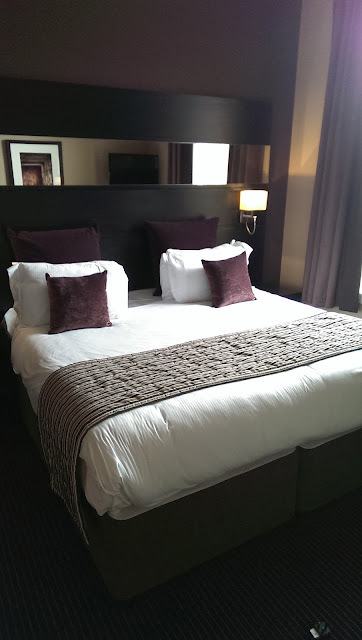 The bed was spacious and extremely comfortable, and the portable fan provided was very handy as we like to be quite cool at night. Despite the bedroom window being right above one of Glasgow's busiest traffic areas- the Trongate- we heard nothing with the window closed. The bathroom's power shower was an excellent way to wake up, and had a wide spray and easy temperature adjustments. 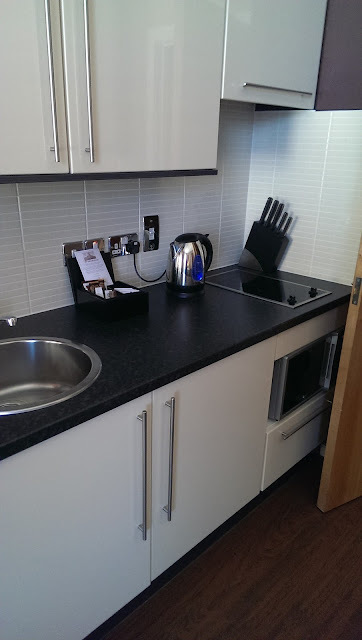 We found having a kitchen area very handy too. The fridge was perfect to keep wine and other treats cool. 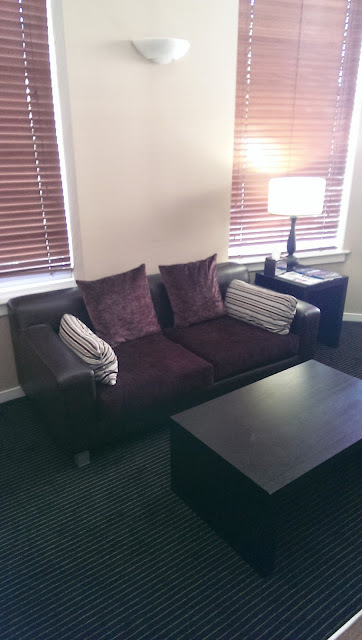 Our room came with continental breakfast, and as it was a serviced apartment, we expected breakfast to be delivered to us by being left on a tray or in breakfast bags outside the door during the night. We didn't expect to have to leave our apartment for breakfast; but we did. Breakfast was served buffet style in a tiny basic room two floors down on the first floor, and sadly this was not at all what was expected. I'd recommend just bringing your own breakfast with you and using the kitchen in the apartment. 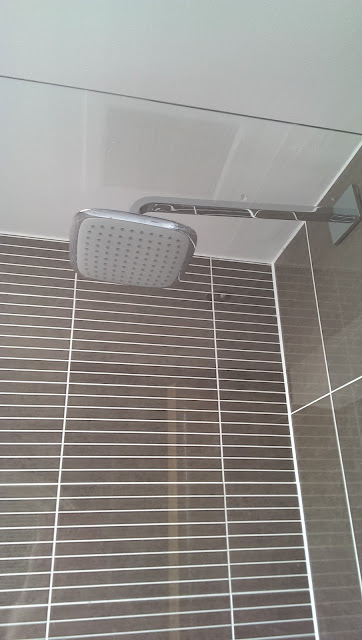 This is the only downside to this otherwise stylish and luxurious establishment. 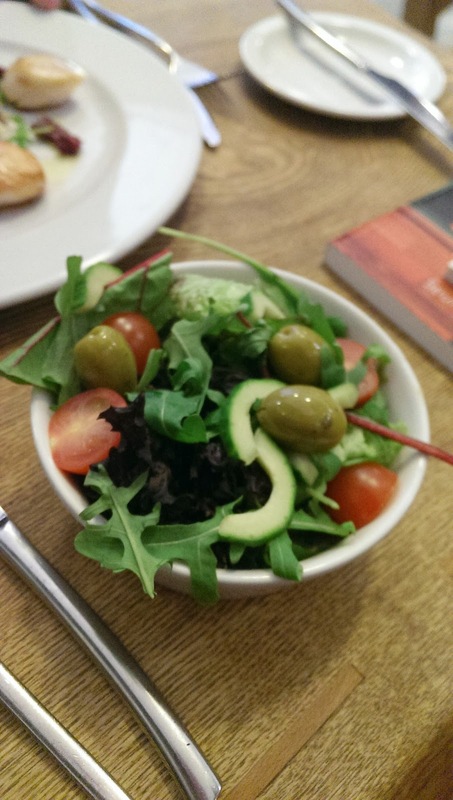 The next day we had lunch across the road at the fabulous Cafe Gandolfi on Albion Street. We cannot rave enough about this restaurant. It is as passionate about quality food and Scottish produce as you can get, and the service is fantastic. For starters we had their famous Stornoway Black Pudding served with mushrooms and a pancake (£7.50). It was a combination to die for. 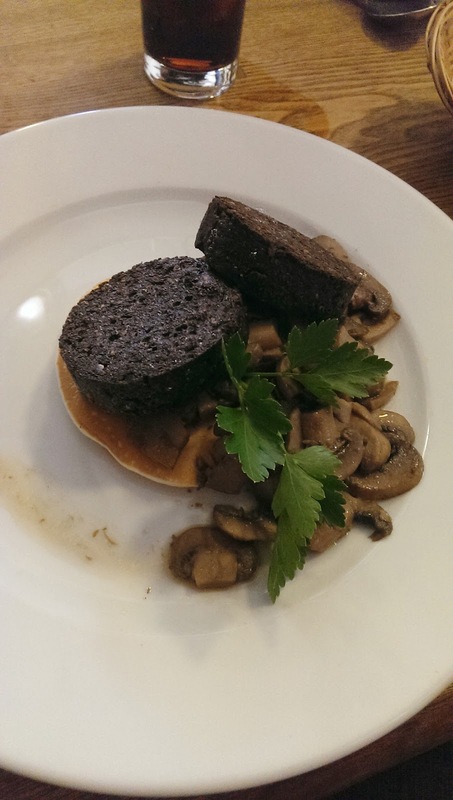 The pancake was perfectly cooked- thick, light and fluffy; and the spice of the Stornoway Black Pudding worked well with the sweetness of the mushrooms. We could have eaten it all day. 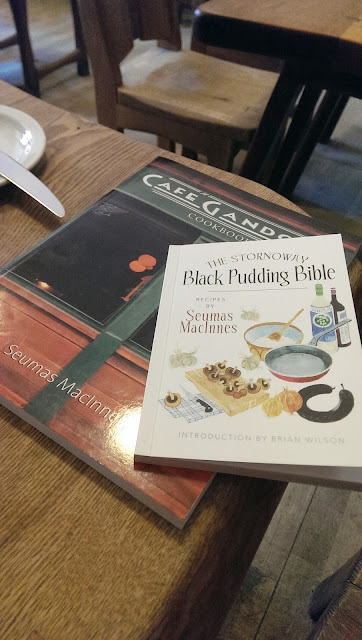 The owner Seumas MacInnes has also written The Stornoway Black Pudding Bible, which has other amazing recipe ideas for this now protected delicacy, and is available from Amazon. After the starter, which was quite filling and could easily be a lunch on it's own, we had Peat Smoked Salmon (£) and the scallops special. 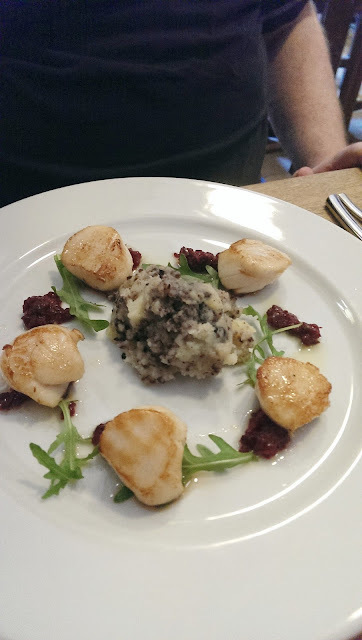 There is a scallops special on the menu almost every day, and they were exquisitely cooked and amazingly fresh. 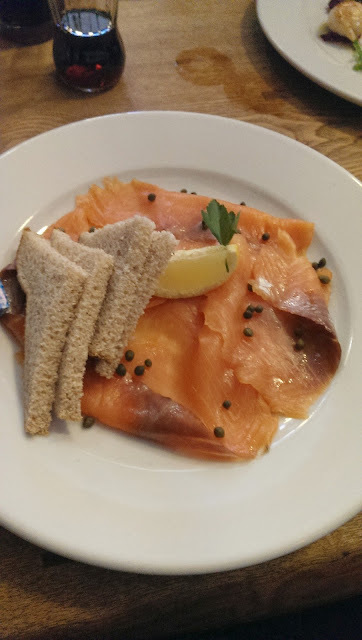 The Peat Smoked Salmon is served with brown bread and a slice of lemon. It's perfect simplicity puts all the focus on the quality of the fish, and was an excellent choice to follow the heavier black pudding starter. The atmosphere of Cafe Gandolfi is so relaxed and laid-back, and its rustic wooden decor highlights its ethos of getting back to the basics of good local ingredients. 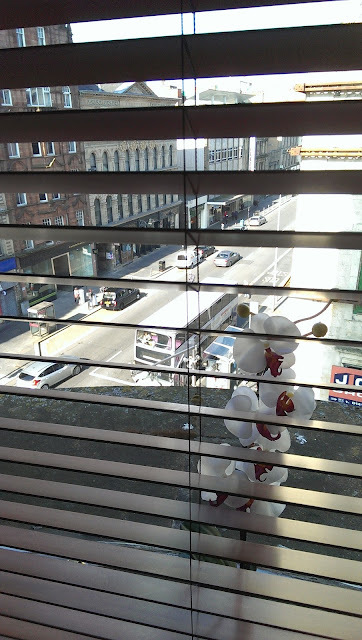 It is a must-visit place for lunch or dinner in Glasgow.